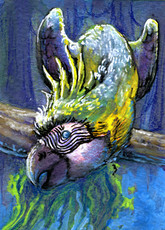 my parrot here is done from federschein :) dont steal it! I agree that parrot looks great. Your painting/colored pencil work is absolutely fabulous! You are so talented in shading and detailing the fur on your animals. It's absolutely amazing. like i said beneath the parrot-pic: done from federschein. it was an art trade. Oh, I thought that said, "for" not "from!" D; Opps. However, your art is definitely at that quality.